All registered students at Indiana State University, are eligible to receive counseling services at the SCC. 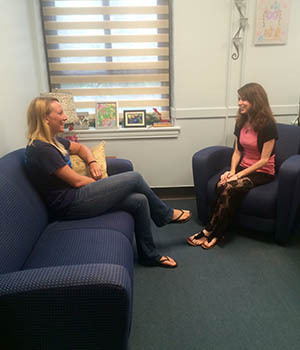 Depression, anxiety, difficulties in relationships, feelings of inadequacy, sexuality issues, identity problems, substance abuse issues and problems interfering with academic functioning are some of the concerns students address through counseling. The SCC does not offer treatment for all emotional or psychological disorders, particularly those disorders that are chronic, severe, or involving the high risk of harm to self or others, including severe personality or psychotic disorders, and severe substance abuse or recovery. Clients needing extended treatment or special services beyond those offered at the SCC will be referred to competent resources in the Terre Haute community. Following that, the standard fee for counseling services is $60 per academic year. The standard fee for services during the summer session is $30. Fees will be billed to the student’s bursar account. If a student is experiencing financial hardships, fee waivers may be approved by our Director. After scheduling your first appointment with our front staff, please plan on arriving approximately 20 – 30 minutes early to complete initial paperwork. You will be given some short forms to read and complete, which will let you know what to expect and will allow you to provide some information about yourself for your intake counselor. You will then meet with one of counselors for your triage appointment. The triage appointment is shorter than a typical therapy appointment. It will last between 20 – 30 minutes. This appointment will help your counselor to gain a better understanding of your current concerns and how the counseling center can best help you. At the end of this first appointment, you and your triage counselor will select a plan which best meets your needs (e.g., individual counseling, group therapy, one session only, or a referral to another office). It is important to mention that the counselor that you meet with for your triage may or may not be the counselor that you continue to see if individual therapy is recommended. Please remember your visit is confidential. Visiting the SCC will not become part of your academic record. Your family and friends don't need to know if you don't want to tell them. Except in emergency situations or in cases where you have given us written permission, we do not share your records with anyone. Groups are a total of 3 hours and take place over a 3 week period. All students referred to the group must complete MyStudentBody, an online alcohol education program designed to promote alcohol awareness for college-level students. Contact us at 812-237-3939 for a list of current and upcoming groups offered. The Student Counseling Center is happy to have therapist, Mr. Bob Brown from the Veterans Administration (VA) working in our office. He will provide free services to those that meet the following qualifications: Must be a current Indiana State student, must be registered with the VA, and must have been deployed to either Iraq or Afghanistan. To schedule an appointment please contact him at (812)-232-2890. The SCC offers personality assessment, substance abuse and eating disorder assessment, cognitive testing for disabilities such as ADHD and learning disabilities, and occasional career testing. Our counselors may recommend certain testing as part of the therapy process. Students are also able to request certain types of testing and the decision to perform such assessments will be made in conjunction with the student’s counselor. Counselors at the SCC may recommend certain types of testing as part of the therapy process, including personality assessment and symptom inventories. This type of testing can help determine the type of treatment a student needs and track progress over time. Specialized testing services, such as substance abuse evaluations or disability assessments, are offered at the SCC for a fee. At times, students may be referred for formal drug and alcohol evaluations to satisfy requirements for Student Conduct and Integrity, the courts, or another referring entity. The SCC uses a structured assessment to determine the student’s current and future level of risk. Recommendations for treatment are made as part of the assessment process, and this information can be provided, at the student’s request, to the referring agency. Often, students may find that they are struggling in their college courses due to issues with concentration or learning difficulties. These problems can be caused by many different factors, including family problems, a recent break-up, poor study habits, anxiety, and depression. In rare cases, a student may have undiagnosed ADHD and/or a learning disability. Step 1: Contact the SCC to schedule a “first contact” appointment. Step 2: Speak with your assigned counselor about your symptoms and possible factors contributing to these problems. Step 3: If you and your counselor agree that ADHD/LD testing would be helpful, you will be placed on a waiting list for the next available testing professional. * At peak times during the academic year, students may have to wait for a month or more before the testing process begins. However, you may continue to meet with your individual counselor for support during this time. Step 4: Meet with the testing professional for a thorough clinical interview. Step 5: Symptom questionnaires, cognitive testing, and in some cases personality testing may be performed based on what the testing professional determines is necessary. Formal testing can take up to 2-5 hours to complete and is usually conducted over 2 or more sessions. Step 6: The testing professional will meet with you to explain the testing results, any diagnosis given, and recommendations of techniques or services that can help you improve. Step 7: The testing professional can provide you documentation of the testing and diagnosis if you wish to register your disability with Disabled Student Services at ISU in order to receive certain accommodations, or to consult with a physician or psychiatrist about the use of medication to reduce the impact of your disability. * Because of the amount of time involved in conducting an ADHD/LD assessment, the entire process could take a month or more to complete. Students should not expect to receive a quick diagnosis of ADHD or a learning disability. Parents, as well as faculty and staff are welcome and encouraged to consult with SCC staff if they believe a student is experiencing distress and would like information or guidance about how best to help. To consult with one of our psychologists, please call our office at 812-237-3939 and ask to speak to an available counselor. For information about what to do in the case of an emergency, please see our Crisis Intervention page. The Indiana State Student Counseling Center and Student Health Promotion Office work collaboratively to provide presentations, programs, events and services to the Indiana State community and the larger Wabash Valley community. As with many other universities, drug use at ISU is an ever-growing concern. As with alcohol, the SCC provides both assessment and brief treatment to ISU students who are deemed appropriate for our services. Individuals needing more intensive treatment are referred to appropriate programs within the community. The SCC does not offer treatment for all emotional or psychological disorders, particularly those disorders that are chronic, severe, or involving the high risk of harm to self or others, including severe personality or psychotic disorders, and severe substance abuse or recovery. Clients needing extended treatment or special services beyond those offered at the SCC will be referred to competent resources in the Terre Haute community. After scheduling your first appointment with our front staff, please plan on arriving approximately 20 – 30 minutes early to complete initial paperwork. You will be given some short forms to read and complete, which will let you know what to expect and will allow you to provide some information about yourself for your intake counselor. You will then meet with one of counselors for your triage appointment. The triage appointment is shorter than a typical therapy appointment. It will last between 20 – 30 minutes. This appointment will help your counselor to gain a better understanding of your current concerns and how the counseling center can best help you. At the end of this first appointment, you and your triage counselor will select a plan which best meets your needs (e.g., individual counseling, group therapy, one session only, or a referral to another office). It is important to mention that the counselor that you meet with for your triage may or may not be the counselor that you continue to see if individual therapy is recommended.